As part of my Lenten discipline, I’ve been cleaning things out around the house. There’s a practical side to it, of course, and it was Bryna who suggested it. Frankly, her “encouragement” preceded Lent by some weeks and had nothing to do with a holy season in the Church year. But as I thought about it, I’ve come to embrace the idea of lightening the material load and there’s a spiritual aspect to this as well. Stripping away some of the stuff you accumulate over the years is freeing. So I’m trying to do a little work every day. This particular book tells the story of the Protestant church in Siloama on the island of Molokai. Many people know the story of how the island became a leper colony in the 1800’s and of the heroic and faithful ministry of Father Damien who died on the island of the disease. What people don’t know is that there was a Protestant church on the island that predated Father Damien’s ministry. Anyway, I have this book because my great-grandfather on my father’s side, the Rev. Norman Schenck, was a Congregationalist missionary who lived out his life in Hawaii. He served as General Secretary of the Board of Hawaiian Missions. I don’t know too much about him other than what’s been passed down by my family — that he was a beloved figure who was dedicated, passionate, and effective in his vocation. But what truly amazed me was an old type-written letter I found tucked inside the book. 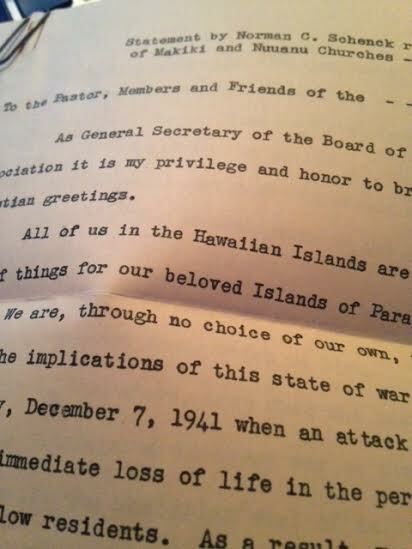 Dated December 14, 1941, it was a pastoral letter sent to the Japanese congregations under his care in the immediate aftermath of the bombing at Pearl Harbor. It astounded me. As General Secretary of the Board of the Hawaiian Evangelical Association it is my privilege and honor to bring you this morning, – Christian greetings. All of us in the Hawaiin Islands are now under a strange and new order of things for our beloved Islands of Paradise. We are, through no choice of our own, in a state of war. The implications of this state of war were dramatically revealed to us on Sunday, December 7, 1941 when an attack was made upon our Islands. This caused immediate loss of life in the personnel of our armed forces and among our fellow residents. As a result, martial law has been declared. All of us have spent this past week in one form of activity or another, seeking to do our part along the lines required by the emergency which faces us. Every resident of our Islands is under a dual obligation. First, he must do his part in the great program of national defense. This is not only a duty. It is a privilege. Hawaii is our home. Every Christian citizen will rise up to defend his home with all the courage and devotion of which he is capable. Already the calm and efficient manner in which our people of many racial ancestries have done this, has been commended by those in charge of our public and private welfare. Let us continue to work together with calm and patient and determined purpose. Second, there is need for all of us to keep up the high levels of morale among our people. This deals with the sources by which men and women live. It is vital to our physical, moral and spiritual health. In this realm, the Christian Church has solemn responsibility. I speak to you this morning not as a Japanese church, – but as a Christian church. We are “one in Christ Jesus.” We are bound together in love, – not to be divided by hatred. The Christian Church is not afraid of suffering. Its only fear is disloyalty on the part of any Christian to our Lord and Master. And, of course, loyalty to Christ inspires loyalty to each other and to the government under which we live. May I, therefore, urge upon the pastor and the members of this congregation to minister in every way to the spiritual needs of people and to intensify the Christian work of calling in the homes, of providing for the children and youth, and of holding high the Christian standard of conduct in thought, word and deed. The Christian Church is needed for moral defense. It is also needed for light in a darkened world. May God be with you, and with your spirits. I remember the fate of the Japanese in California. What happened to the Japanese Hawaiians? A small percentage were interned as I understand it. Many young Japanese men from Hawaii served in the United States military overseas — often sent into extremely dangerous situations resulting in high casualties. I’m no expert on this subject but I understand there were more Japanese in Hawaii than on the entire mainland combined. So much of his letter applies to us today. Your great-grandfather sets a high standard for all of us now. Father Tim is right. A small percentage of those of Japanese ancestry in Hawaii were interned. I remember our Asian American Studies professor telling us that it was deemed harmful to the local economy if they interned Japanese Hawaiians. They were, as now, vital to the Hawaiian economy. It would be akin to the population/brain drain after the Moors and Jews left Spain: Nobody to work farms and orchards, and professionals, skilled workers, and artisans leaving in droves. It took a long time for several areas in Spain to recover after that. The only difference is that after the War, Japanese Americans on the Mainland returned from the camps, and they did as much as they could to resume their lives. Many of them lost their property and livelihoods, and try as they might, many of them could not get back on their feet without help. Thanks for sharing this letter with us. Thanks, Josh, for this. Very helpful. You’re welcome, Father Tim. The same thing happened with the Huguenots in France. Damaged industry and commerce for a while in many areas of France. Amazing example of the treasures awaiting when we follow our Lenten discipline!